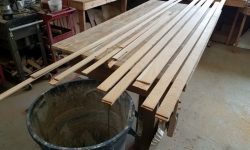 I’d used up most of the trim pieces I’d previously milled, so in order to keep moving ahead on trim it was time to prepare more stock. 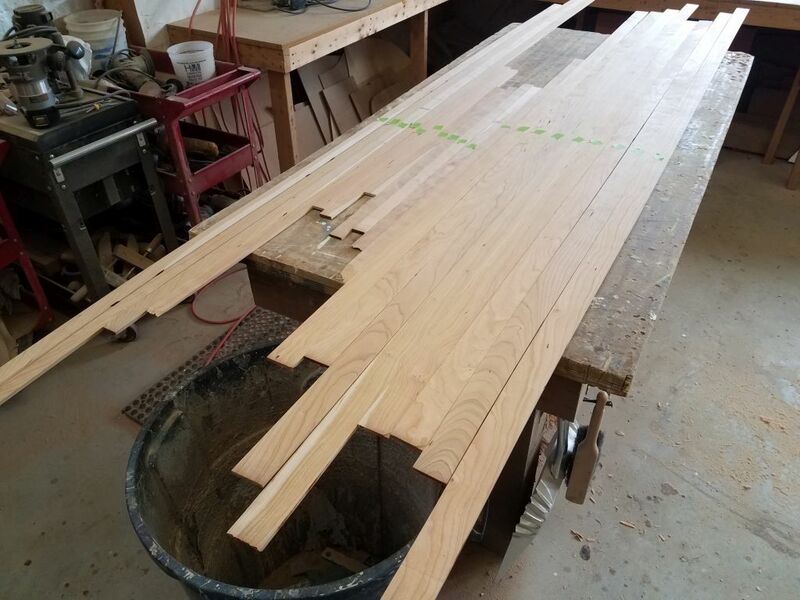 From my stock of cherry on hand, I proceeded through various milling steps to straighten and rip the boards to appropriate widths–2″, 3″, and 1-1/4″, in this case–and then resawed each board in half across its thickness, creating a series of planks just over 5/16″ thick. 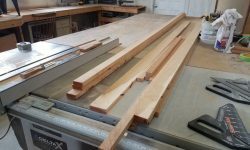 I kept a couple of long lengths of 2″ stock at full thickness to use for door stiles and rails for various interior doors later. 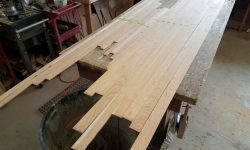 From here, I used the planer to dimension each piece to the final desired thickness of 1/4″, smoothing both sides in the process. 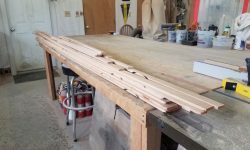 Then, I sorted through the pieces and chose the best side of each, and, for the moment, marked it with a scrap of tape so I could keep track. 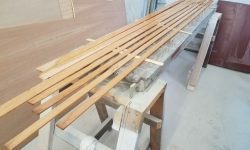 I picked four of the planks to use as ceiling material in order to finish off the forward cabin, and on these I used my sanding block to create the small chamfers on the two top edges, as I’d done on the other ceiling boards, and, since these were my immediate priority, cleaned them with solvent and took them up for their sealer coat of varnish while I continued work on the remaining stock. 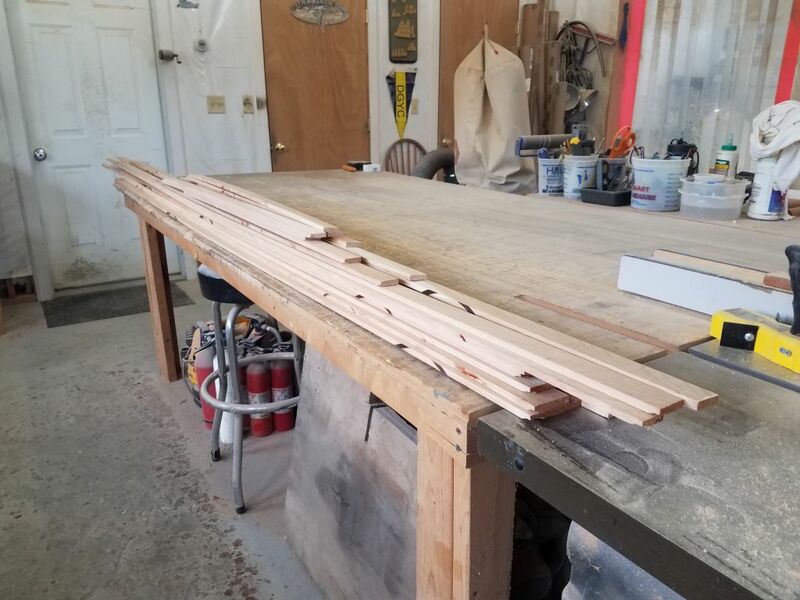 Any leftover pieces of the ceiling stock could be repurposed later for either the cabin sole, or for other trim as needed. 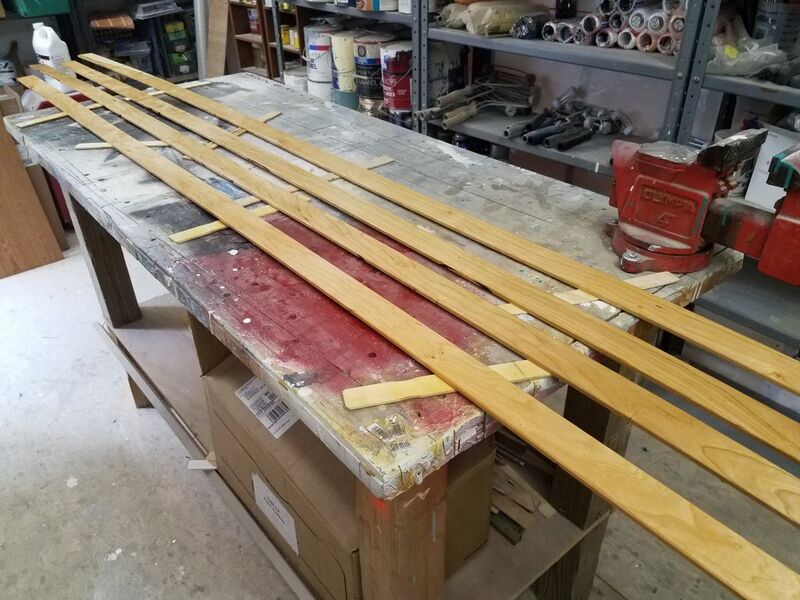 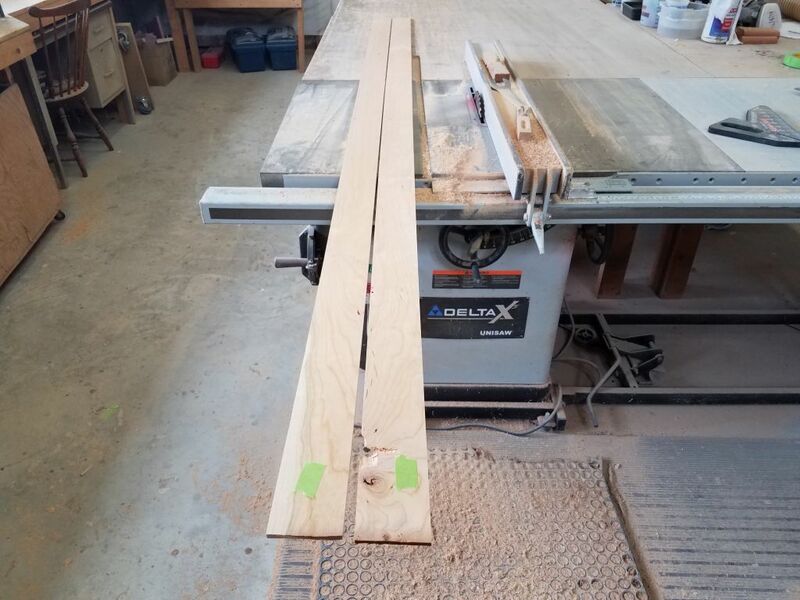 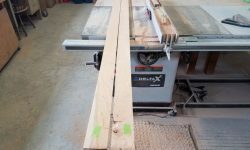 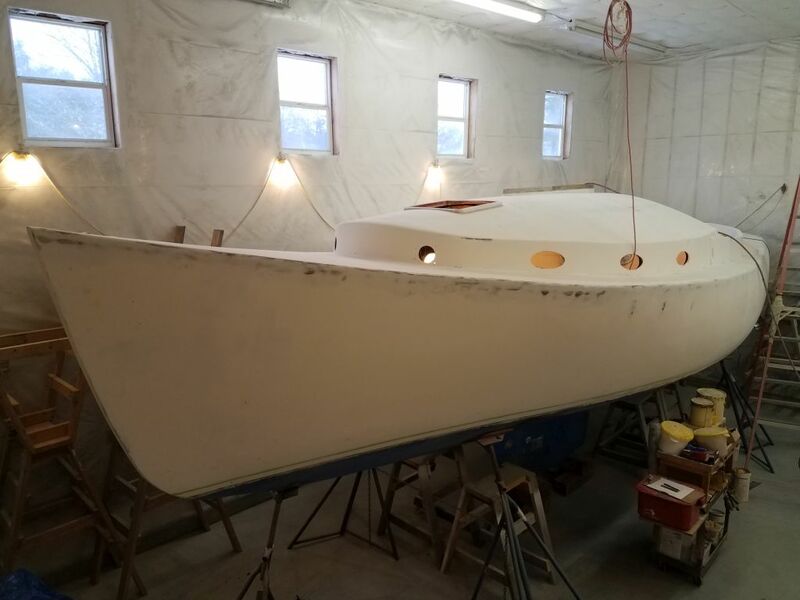 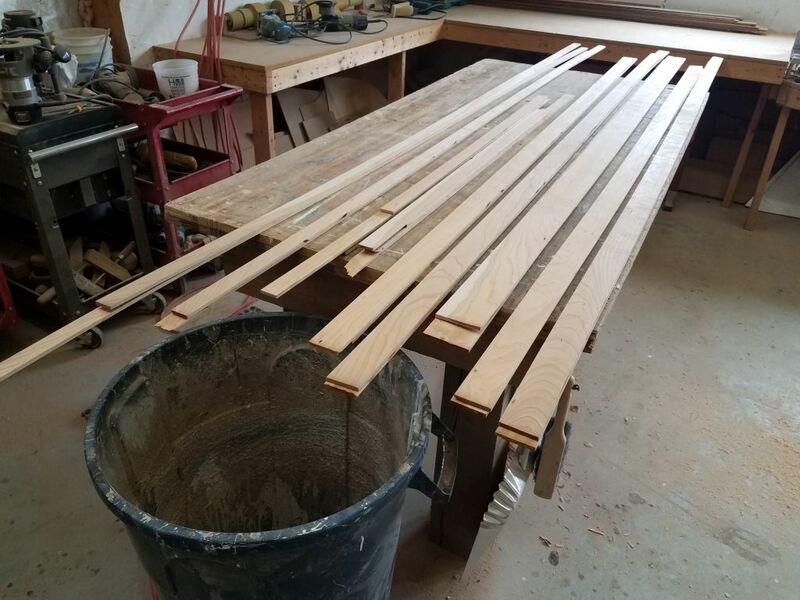 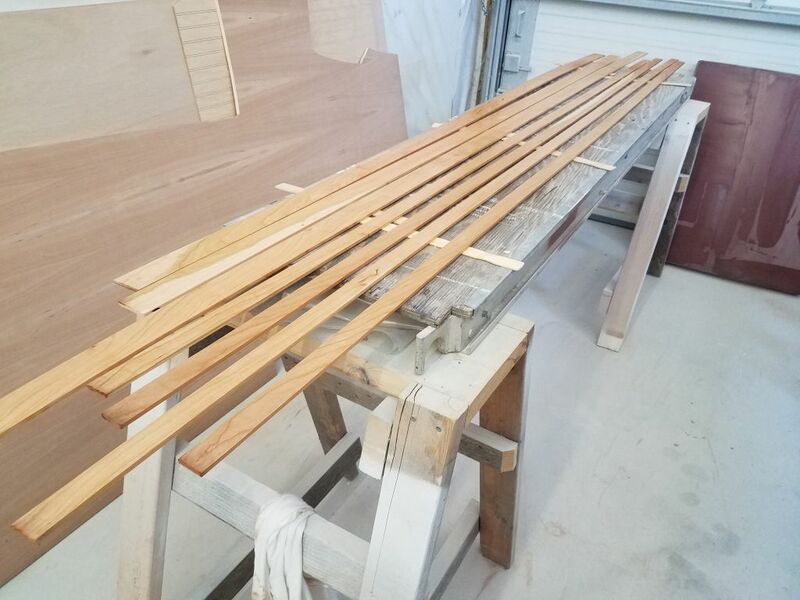 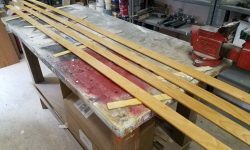 I’d also milled additional 2″ wide stock to have on hand, as well as some 3″ wide pieces for the forward hatch trim, and a series of 1-1/4″ wide pieces that I planned to use to trim between the bulkheads and overhead throughout the boat. 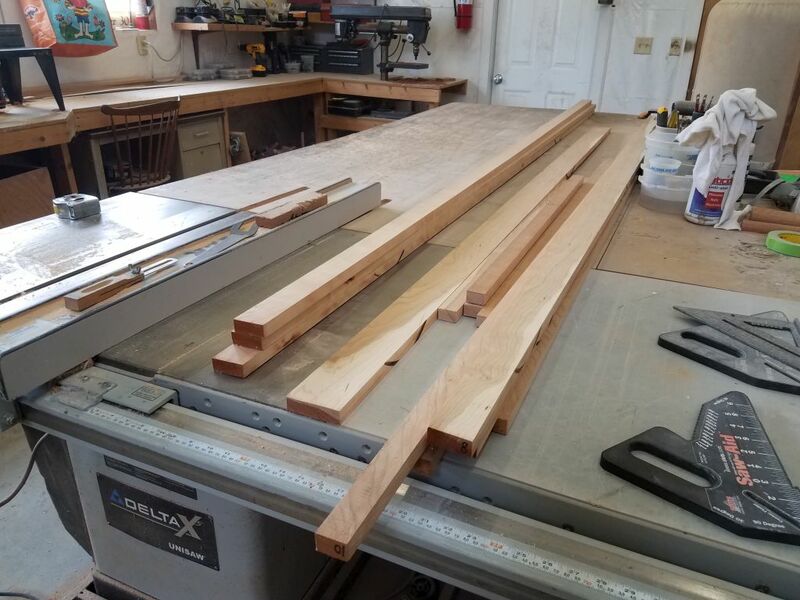 I hoped I’d milled more than enough for everything planned, but also didn’t want to overdo the amount of wood that I turned into small pieces. 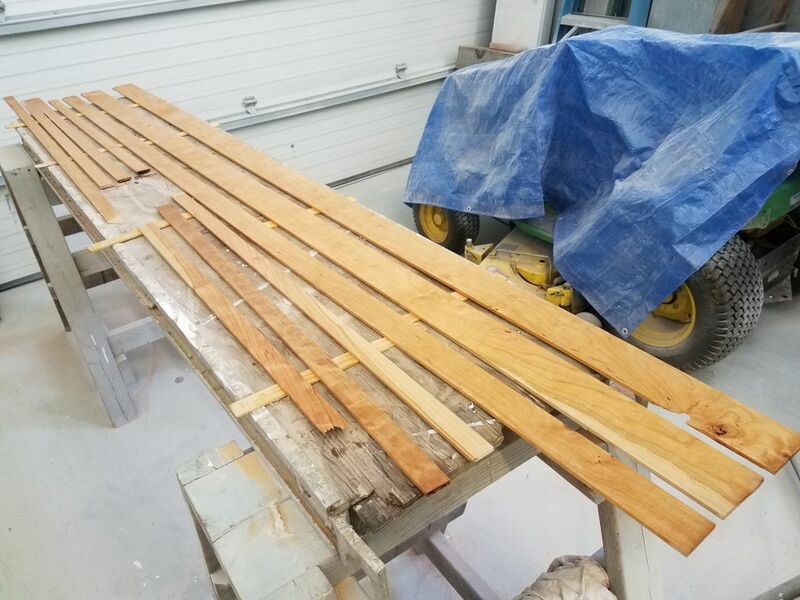 In any event, the remaining trim needed the edges sanded to remove tool and burn marks from the milling process, since at least some of these edges would ultimately be exposed, so I took care of that and, afterwards, cleaned and applied thinned varnish to all sides of all the pieces. 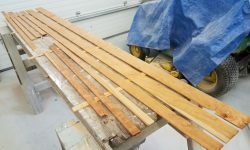 Now with all this prepared trim on hand, I thought I’d have no trouble staying busy in the boat for quite a few days.